Greater oversight of fire and rescue services is needed to prevent death and injury to firefighters, according to a report by a University of Stirling academic on UK firefighter fatalities at fires from 2004 to 2013. The report recommends that the direct and indirect role of central and senior local government and brigade managers in firefighter fatalities needs to be addressed, given the responsibility these bodies and individuals have for regulations, budgets, staffing, systems, training, equipment and resources, information and specific standard operating procedures that firefighters use. Detailed recommendations to address the structural and functional failures that threaten firefighter health and safety are made in the report. These relate to a number of different organisations and areas: Government departments, the Health and Safety Executive, UK Fire and Rescue services, local government, laws and legal matters, and the availability of statistics. Action is needed to improve risk assessment, risk management and training by fire and rescue services; an end to brigade ‘self-regulation’; improved independent inspection and measures for more rapid implementation of investigations of fatalities and injuries. The report, entitled ‘Firefighter Fatalities at fires in the UK 2004-2013: voices from the fireground’, was produced by Professor Andrew Watterson, of the University of Stirling’s Occupational and Environmental Health Research Group (OEHRG) and funded by the Fire Brigades Union. Professor Watterson said: “Whilst the risks of firefighting are obvious and can be complex, the scale of death and injury is unacceptable. Many risks are avoidable as fatal incident enquiries have shown if appropriate management and systems, inspection and regulation, training and other related matters are in place. “Good practice has sometimes been ignored so the problem is compounded by lessons slowly learnt, stifled communication of information, lengthy legal wrangles creating a justice deficit and organisational denials of accountability. 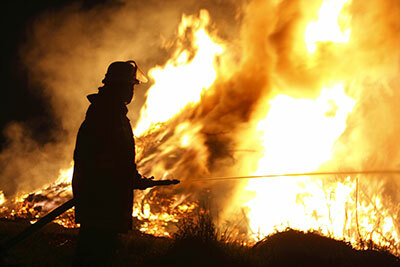 Public and firefighter safety has not been prioritised when it should have been”. Budgets cuts in training, staffing, equipment and fire stations and continued operational duties of much older firefighters may also have serious impacts on firefighter safety at fires, which may not emerge for some time. Professor Watterson added: “There should be defences in depth that run from the top of government, through regulators and brigades to the fireground - vital to protect firefighters on the fireground in all incidents, yet on occasions they have been missing and firefighters have been left defenceless and lost their lives. Risks may not have been ‘highly calculated’, assessed and reduced. There were six firefighter deaths at fires in England between 1993/4 to 2003/4, but in the next ten years this doubled to 12 firefighter deaths and one fire technician death. A further death occurred in Scotland and another in Wales. In Britain since 2010, it has been reported that there have been over 5000 firefighter jobs lost, 39 fire stations closed and response times increase substantially. The research drew on interviews with firefighters as well as inquiries, inspection reports and trial papers. Full report: Firefighter fatalities at fires in the UK 2004-2013 Voices from the fireground. Further information is available from Professor Andrew Watterson, tel: 01786 466283 / 07563 195904, email: aew1@stir.ac.uk. For more information on the University of Stirling’s Occupational and Environmental Health Research Group, please visit http://bit.ly/1H5X3Wz. The Fire Brigades Union is the democratic, professional voice of firefighters and other workers within fire and rescue services across the UK. We have a proud history, and since our foundation in 1918 have helped create and develop the modern fire and rescue service. www.fbu.org.uk.